Has anyone else noticed that each year the “school supplies” list seems to get longer and longer. While you might be able to get some good deals if you watch the ads starting in June and work on it all summer – wouldn’t it be nice to just get a chunk of change to help you pay for it all? 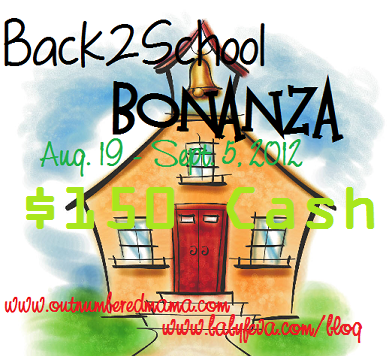 The Back-to-School Bonanza – hosted by OutnumberedMama and Baby Feva – is your chance to get just that – plus a little extra for you too! One lucky Winner will receive $150 – via PayPal – CASH! And three other winners will each receive a Gutzy Gear Prize Pack (one set of strap covers and some patches) to help your kid rock their backpacks. This giveaway is a result of the collaboration of these blogs. Please visit them all for exciting info, great tips and tons of fun! Please use the RAFFLECOPTER below to enter this giveaway. Grand Prize of $150 is open internationally – as long as you have a VALID PayPal address, you are eligible to win. Secondary Prizes (Gutzy Gear Prize Packs) are open to US Residents ONLY. Disclaimer: The prize money was provided by the blogs listed above.